Summer always bring change to how I look after my skin, what perfumes I am using and of course I need to think of sun protection as well. Somehow in the summer I get a bit lazier when it comes to makeup and skincare as the nights are long and all I think about is to do fun stuff in the sunshine. However, your skin still needs to be look after and be protected. You need to hydrate and also think about sun rays. 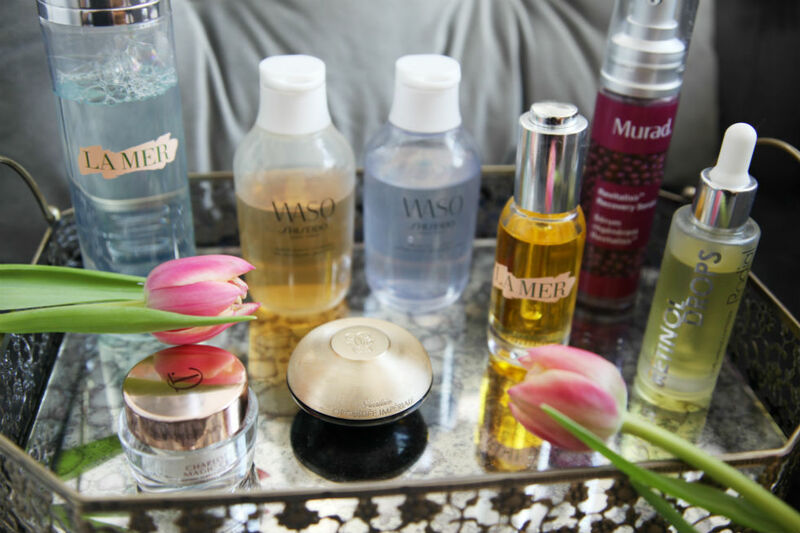 I love to feel the glow too especially in the evenings and I prefer to use lighter creams and serums. 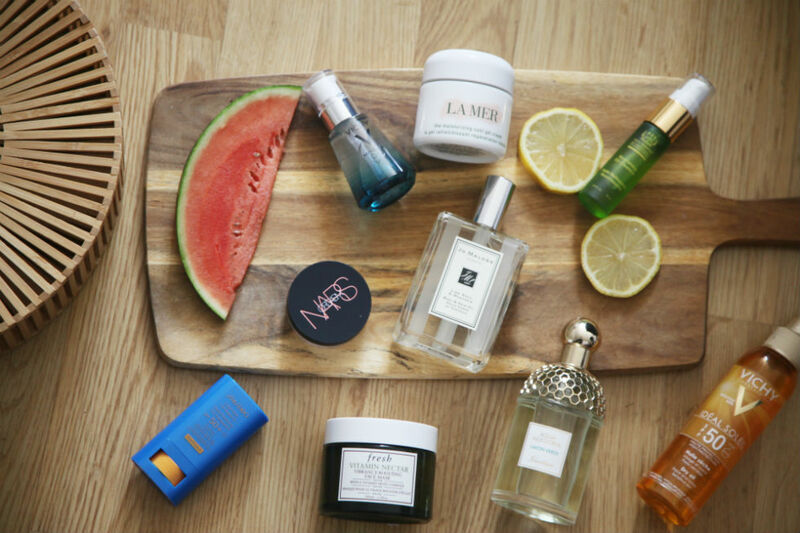 So I thought I would bring some of my favourite products I have been using this summer. When I think of makeup in the evenings I like natural makeup, with juicy lips and lot of highlighter for the glow. When using face masks I love the feel of fresh skin. 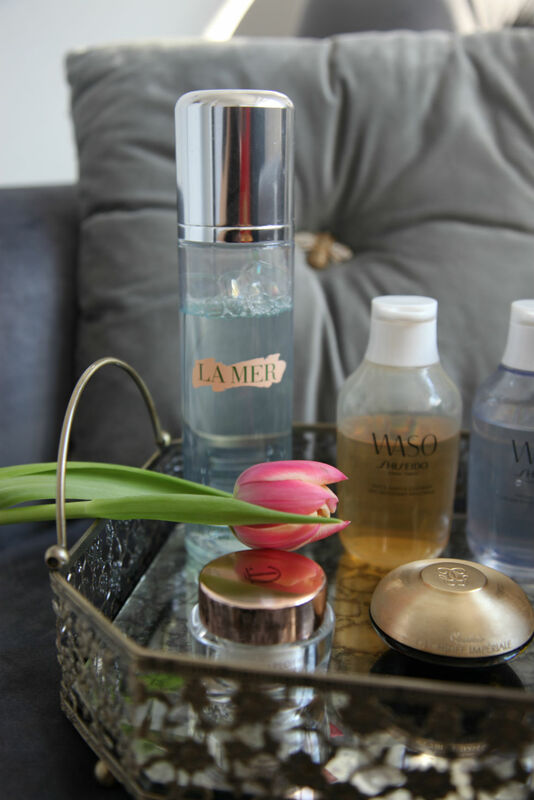 I have been loving this La Mer Gel Cream that is just perfect for hotter days. The texture is lighter however you are not losing on what the skin needs. V lete vzdy zmenim kosmetiku a take to jak se staram o pokozku. Casto take menim parfemy, protoze mi jako vetsine zkratka vyhovuje neco lehciho a sveziho. A tak nejak vubec v lete zlenivim, je to asi tim, ze nosim mene makeup, vecery jsou delsi a uz od rana premyslim, co budu delat zabavneho, at uz dny v parku ci u vody. Ale tak ci tak pokozka potrebuje hydrataci a take ochranu pred slunickem. Ja treba osobne rada pouzivam produkty s lehci konzistenci, produkty, ktere mi daji pocit svezesti a take lehci sera, co krasne hydratuji. A tak jsem vam chtela par oblibencu ukazat. Kdyz se licim, pouzivam spise nejake BB kremy a na vecer mam rada rozjasnovace, zkratka veci, co k letu patri. Libi se mi minimalnejsi makeup, svezi rty a rozjasnena tvar. A tohle leto jsem si hodne oblibila tuhle verzi La Mer kremu, ktera ma lehci formu, pripominajici gel. Vsechny produkty muzete omrknout nize. 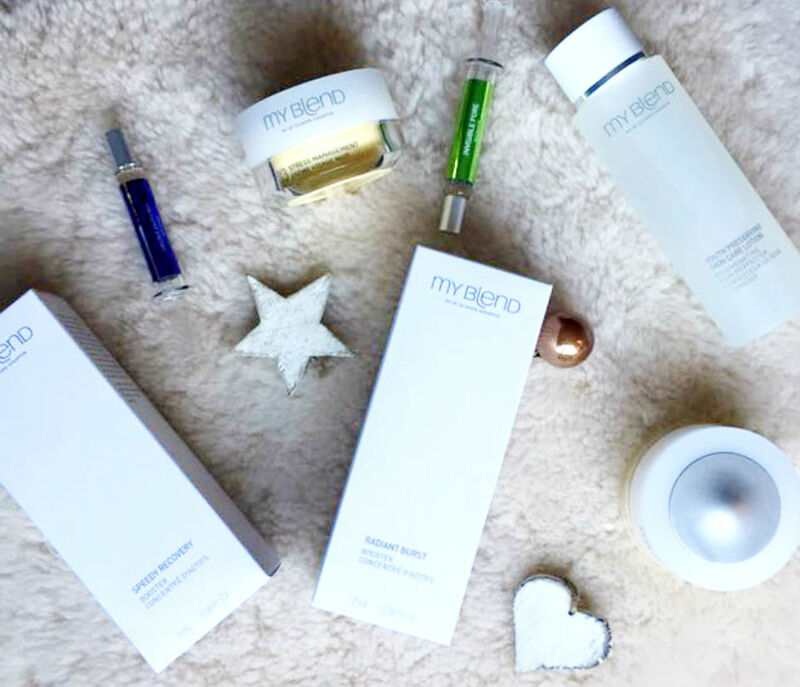 If you have been following me for a while you know how much I love skincare and discovering new products and also you know how much I love personalised things. I have recently discovered a perfect combination of those two things and added them to my usual skincare routine and wanted to share this unique concept My Blend developed with all of You. My blend has been founded by Dr. Olivier Courtin, the son of the founder of Clarins Group and offers a new concept that is tailored to your needs and your lifestyle. That got my attention straight away and I decided to go on this little journey to test it. The first step of the process was a call with a Beauty coach (you can also do an online test which may be easier for lot of you) who diagnoses your skin by asking you relevant questions about your lifestyle, diet, where you work, how much you sleep and so on. So the content of your creams may change few months later. My Blend offers 5 essential formulas and my test showed my creams have to focus on stress management. There is no surprise as if you even follow my youtube channel where I have mentioned My Blend in few of my vlogs, you realise I do a lot in one day and look after a toddler at the same time. I also do not sleep enough, have early starts and so on. However, it is not just about 5 different creams but you are then diagnosed which boosters does your skin need at the moment the most? It all depends on things like size of pores, dullness of your skin, redness etc. My blend basically offers 350 different possible blends which is definitely a lot and it only confirms how tailored the skincare is. It honestly is a great concept and although I first had a feeling it is very overwhelming I found it very easy to mix the boosters with the creams and started to use them straight away. In the end I actually had fun mixing it and felt like I am working in a lab at least for few minutes. The night and day creams are now part of my skincare routine and I am seeing first results after just few weeks. The biggest impact I have noticed is definitely in the size of my pores. They are less visible and also the skin seems to be more radiant. My skin feels hydrated but you do not have to be worried that the cream feels heavy or too oily. It has got a lovely consistency and packaging as well. Both day and night cream became smoothly part of my routine and I am very happy with them. Jak asi vite, mam rada veci site na miru a mam rada i kosmetiku. Bavi me objevovat nove veci, stridat a menit rutinu a vyzkousela jsem spoustu produktu vcetne produktu na zaklade vaseho DNA. Ale nedavno jsem mela moznost vyzkouset novy koncept navrhnuty doktorem Olivirem Courtinem, ktery je zakladatelem skupiny Clarins a prisel na trh s novym produktem a znackou My Blend. Jedna se o kremy site na miru na zaklade vasich momentalnich potreb a vaseho zivotniho stylu. Nebudu vam lhat, ze jsem castecne chtela produkt vyzkouset uz jenom diky jmenu Clarins, protoze jejich veci mam moc rada, ale cely projekt mi prisel zajimavy. Cely postup zacal tim, ze jsem mela skype pohovor se specialistou (tento test se da udelat i online), ktery mi polozil serii otazek, aby identifikoval muj zivotni styl. Na zaklade toho mi specialista vybral jeden z peti zakladnich kremu a ten muj je vhodny pro lidi, kteri citi denne stres a natlak. Neni se u me ceho divit, malo spim, hodne pracuju a do toho se staram o batole. Jestli sledujete muj youtube kanal, urcite se nebudete ani divit. A tam jsem vlastne My blend ve mych vlozich nekolikrat zminila. Ale kremy to nekonci, dale jsou vam urceny specialni boostry, ktere budou take pokazde jine. Muzete mit problemy jako rudnuti, velke pory atd. Nebudu vam lhat, kdyz mi prisel balicek s produkty, trosku jsem se bala, nerada ctu navody atd a musite si samy boosters do nocniho a denniho kremu namichat, aby se vse udrzelo cerstve. Ale nakonec me to bavilo a bylo to opravdu jednoduche. Nejlepsi na tom je to, ze vlastne za tri mesice se mohou me kremy zmenit, opravdu zalezi na tom co ted delate, kde zijete, pracujete, drzite dietu, spite vice ci mene atd. Ja jsem s kremy velmi spokojena, nejsou hutne a presto krasne hydratuji a uz vidim prvni vysledky a uplne nejvice ve velikosti poru. Ty se znatelne zmensily a kremy mi opravdu sedi. Libi se mi i baleni. Mozna nepusobi extra luxusne, ale myslim, ze jsou sik a lehke. Opravdu s radosti jsem kremy zasadila do me kazdodenni rutiny. A je to kazdopadne zajimavy koncetp, mozna uplne idealni pro ty, kteri stale jeste hledaji ten svuj vysneny krem. In collaboration with My Blend. Changes of season may also bring changes to your skincare routine. The sun, the sea, the hot weather always has got some sort of impact on your skin. Higher SPF protection however also consistency of products, level of hydration. You know I love to try and test new things and I wanted to share with you my new current favourites I have been using for few weeks now. These seem to really nourish my skin in the hot weather and they are all very light. I love waking up every day to see changes in my skin. 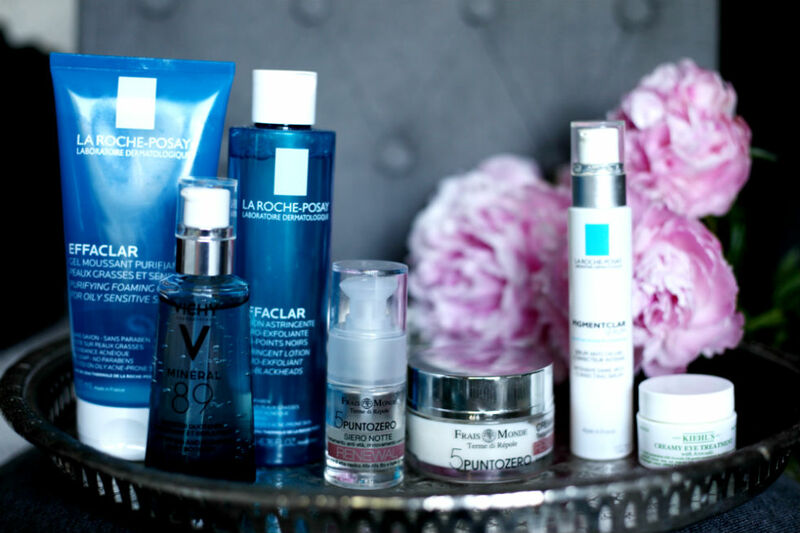 As always using skincare should start with preparing your skin and I start with La Roche Posay Effaclar Foaming Gel followed by this amazing Facial Toner. Before I start to use any creams or serum I apply Vichy 89 Mineral. One of my issues have always been tendency to have pigmentation marks so I am currently using this serum from La Roche Posay. And I cannot forget taking special care of area round your eyes. This Kiehl’s eye cream has been one of my favourite products for some time. However, one of the hottest additions is definitely this amazing set by Frais Monde which is an Italian brand. This set is called 5 Puntozero Renewal. It contains mineral waters and really made a difference to my skin. I am not sure if it is available in UK but I am really impressed. My favourite is definitely the serum for night which smells divine, is super light and the skin looks so glowy and tight each morning. One of the lucky readers will be able to win this set however this is only applicable for readers from Czech Republic. I hope you enjoyed reading about the hottest additions in my skincare collection and let me know if you have any amazing products I should try. Zmeny rocniho obdobi prinasi casto i zmeny v peci o plet. Slunicko, more, teplo urcite ovlivni plet a pokozku. Samozrejmosti je urcite vyber dobreho kremu s vysokym SPF, ale pro me jsou dulezite i veci jako konzistence kremu, hydratace a vyziva. Jak vite, hrozne rada zkousim nove produkty. Rada veci menim, i kdyz tomu tak drive nebyvalo. Tohle jsou produkty, ktere me ted hodne bavi a velmi casto je pouzivam s tim, ze obcas neco obmenim a take pridavam nocni krem apod. Jak to vetsinou byva je dulezite plet poradne ocistit a pripravit. Ja ted zacinam s La Roche Posay Effaclar Foaming Gel a pak nasleduje tento uzasny toner. Nez pouziju nejaka sera a kremy, aplikuju 89 Mineral od Vichy, ktery jsem zacala pouzivat nedavno. Nesmim zapominat take na to, ze mam sklony k pigmentovym skvrnam, tak samozrejme pouzivam i kremy s SPF a kdyz nemam krem, tak pouziju makeup s SPF a bojuju ted momentalne i pouzivanim tohoto sera na pigmentove skvrny. A nesmim zapominat na specialni peci kuze kolem oci, ktera je velmi delikatni. Velmi casto pouzivam tento ocni krem od Kiehl’s, ktery uz mam v oblibe nejakou dobu. A jeden z vas ma moznost vyhrat sadu Puntozero podle vaseho typu pleti. Soutez bude probihat na mych strankach na Facebooku. Staci me sledovat na Facebooku, dat like fotce. Jako bonus vas dam do slosovani dvakrat, kdyz prihodite pod tuto stejnou fotku i koment a budete ji sdilet. Preju vsem hodne stesti, protoze je to opravdu skvely produkt.